Not nearly as good as The Maze Runner, but I enjoyed it nonetheless. This book was CONFUSING. I swear, half the book I had no idea what was going on. 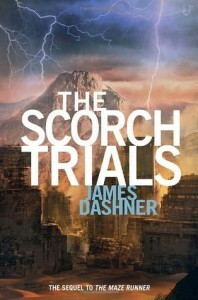 It seemed like the Gladers were just mindlessly wandering the Scorch most of the time. I know they didn't have many other options, but I think their "trial" as a whole could have been done better and been made a little more interesting with a little more explanation. Also, it seemed like we got no new answers in this book. Yeah, The Maze Runner was a little confusing at first, too, but you eventually got answers to your questions and learned a little about the world. I felt like in The Scorch Trials, 100 new questions were raised and maybe 5 answers were given. I was getting really frustrated reading this because I felt like the overall plot was going nowhere. And the end didn't even wrap anything up! If anything, I'm even more confused having finished the book than before. That being said, this book still had redeeming qualities. I'd still call it a fun read -- it definitely had enough exciting and scary moments to make the read worthwhile. I have hope that The Death Cure will finally provide some answers and that I'll get to understand this world. I like the story, I do. I like the characters for the most part, and the world and their "trials" are really intriguing. Given how much I enjoyed The Maze Runner, I'll be disappointed if the third book doesn't give an exciting yet satisfying conclusion to the series.